When you are planning to buy a child bike trailer, it is evident that there are lots of factors that you must take into consideration. In such a diverse market featuring numerous brands and models of bike child trailers, the prospect of finding the best product for your kid might always prove to be a daunting task. With standard child trailers, your kid can relax and enjoy the ride as he gathers some experience as far as the world of biking is concerned. This article aims at examining some of the best bike trailers for kids and toddlers, with the primary objective of making you have some concrete knowledge, so that you might be able to make an informed decision when purchasing one. 1 What to look for when purchasing a kids bike trailers. 2 Review of the of the best-selling child bike trailers. What to look for when purchasing a kids bike trailers. As a matter of fact, kid bike trailers can be quite costly. High-quality products such as the Cougar 2 Chariot are likely to cost around $750. Such expensive brands offer a broad range of functions, and can be converted to ski trailers or strollers. You pay more for additional range of functions but in the long run, maybe save a bit of cash and space in your home garage by not having to buy a jogging stroller as well. If you opt for a single-function kid trailer bike such as the Schwinn Trailnblazer, then you can always save money by spending less bearing in mind that such models are always cheaper. It is always advisable to go for kid trailers that offer protection against various weather conditions. Does it have fabric or a plastic shield to protect your kid from the wind, rain, the heat from the sun plus other debris that are kicked by the bike in its wake? Take this into account. Additionally, the availability of tinted windows provides protection against the sun’s glare and also keeps the interior of the trailer much cooler. Trailer wheels are in most cases made of steel rims, implying that they are likely to rust. Others are also made of aluminum rims which cannot rust and are also light in weight. Additionally, larger wheels of about sixteen to twenty inches will adequately handle the threat of bumps, compared to smaller once. On the other hand, smaller wheels offer more maneuverability. Choose wisely. It is recommended that you prioritize the wheels that have reflectors, and top-notch inflatable tires that permit your trailer to roll easily on surfaces that are uneven. The trailer should have an easily foldable design, implying that you should look for trailers with quick-release wheels and with quick-folding mechanisms. This offers a small storage space, thus saving you from the headache of keeping your device. Most of the frames of the kid trailers are made of steel, while more pricey models are made of alloy, which is lighter. Ensure that the frame is sturdy and has a roll cage to provide additional protection in the event of a rollover. 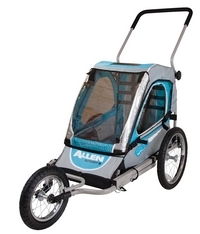 The trailer you’ll purchase must have an adjustable and padded five-point harness to restrain your kid. Models meant for two toddlers should have two harnesses. This is an added feature for safety and gives your child the much-needed protection. Review of the of the best-selling child bike trailers. This is Perhaps one of the cheapest, ASTM-certified child trailer on the market. It is light in weight and comes with the functional Flex Connector that allows it to lay flat while the trailer remains upright. It boasts of rear and tinted windows with highly integrated 30 UPF to offer protection for your baby against the sun. Also available are side battens that create a barrier between your child and the wheels. This is a high-quality item that protects up to two passengers with its complete internal roll cage, the heat-treated frame of aluminum and five-point safety harness. The convenient rear tailgate at its disposal provides quick access to cargo, while the quick–release tires roll smoothly as the compact folding design flattens it for mobility or storage. This particular one is a highly versatile single passenger trailer bike that offers durability. It has hitch/coupler allowing for easy and quick attach and reattachment to any adult bike. 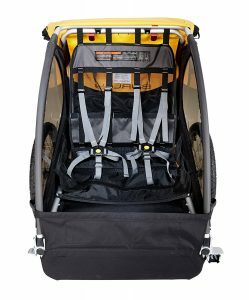 A sixteen-inch air-filled tire, a two in one canopy with a weather shield and bug screen and an internal harness are all included. For convenience in both storage and use, it comes equipped with tool-free quick release wheels and a folding frame for easy mobility and storage. If you are a family-minded recreational cyclist, this is arguably an item that you must have for your kid. 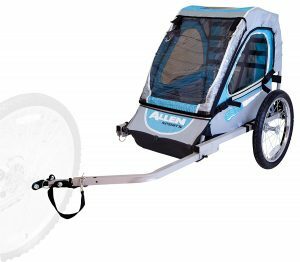 Designed for individuals looking to extend their touring experiences to their children, the Trailnblazer single bike trailer boasts of quick release wheels and a folding frame that allows for easy storage. Whether you are either looking for style or performance, the product has got you covered, bearing in mind that it has sixteen-inch pneumatic wheels with molded rims. It is highly versatile, and can be used in a wide range of weather conditions, thanks to the two in one canopy that includes a weather shield and a bug screen. It is highly affordable, and the price ranges between $100 to $120. 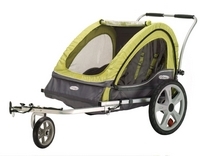 An extremely durable child jogger trailer, which is light in weight, thanks to the steel construction at its disposal. You can easily and quickly set it up, either as a bike trailer or a fully fixed functional wheel jogger right from the box. The twelve-inch anterior wheel for jogger mode, a sixteen inch rear wheels provides a lower rolling resistance, while the large side and front windows enable your baby to enjoy her/his riding experience. The good thing about this particular trailer for a toddler is that it comes with a foot bar that offers protection to your kid’s feet and also has a removable three-season rain shield and bug. When not in operation, its quick release wheels and folding design allows for easy storage and transportation. The universal coupler at its disposal enables it to attach to most brands of bicycles. This is ultimately another top quality brand that you should always consider for a buy. 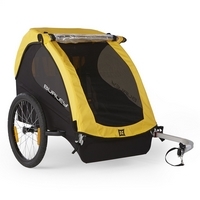 Click here for our buying guides on other types of bike trailers.